Since I publish the WHB recap rather late on Sunday night, I usually take off Monday and don’t post anything new to the blog. But this Monday I couldn’t miss mentioning that today is the first birthday of my blog! 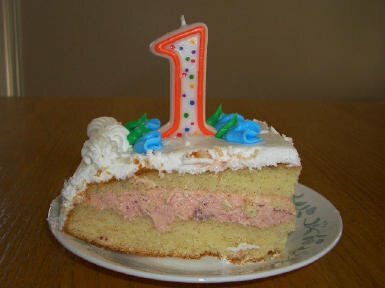 Kalyn’s Kitchen is one year old today, and what a great year it’s been. Who could have imagined that a year ago when I started this blog as a place to store recipes online that I would meet so many great people, learn so much about new foods, and have so much fun learning about internet publishing? I didn’t even know that the whole food blog community existed when I started writing Kalyn’s Kitchen, and I certainly never imagined what the blog might lead to. Here’s my very first blog post. The funny thing is, when I went back into the archives to look at it, the first thing I saw was a typo. It’s been there for a whole year, so I just left it for your amusement. See how much better I’ve gotten? Thanks to all my great readers and friends and family members who keep me going with nice comments and words of encouragement. I also want to send a special thanks to Rand and Bradley, since most of what you see here could not have been possible without their assistance and support. The cake photo is from my niece Heather’s baby shower, hosted by my sister Sandee this past Saturday. And by the way, I did not eat all that huge piece of cake, but I did eat some. Congratulations and well done in reaching this milesone in such style! Happy, happy blogday!! You should be so proud. Happy birthday to Kalyn’s Kitchen! Quite a milestone. Congrats on a great year of blogging! Happy Blog Birth/Anniversary day Kalyn! Thank you everyone for all the nice thoughts. It was been very fun so far. Happpy Blogiversary Kalyn! Here’s wishing you many more to come! Happy First Bloggaversary, Kalyn! I think I still have half a year to reach mine. Happy blog B-Day…this is such an important day…congrats! Coincidentally, I am featuring your blog today as a special ‘Blog of Note’…!! Happy Blog Birthday Kalyn! Here’s to many, many more. I’m stealing five minutes on my dear husband’s computer – when I should be shredding/packing – to wish you [& said blog] a BIG happy birthday! Happy First Birthday. I think you should do what all 1-year-olds do on their first birthday: Smear the cake all over yourself and your floor, chase balloons (and cry when one pops), tear open presents and eat the wrapping paper, and then pass out in a strange position on the floor fast asleep. One year already? Congratulations! Happy Blog Birthday, Kalyn. It’s been fun to get to know you virtually. When I first saw the picture of the cake, I was wondering if it was a low-carb creation (but then you explained).